The financial year ending 31st March 2019, has so far been a fantastic one for Capcom (TYO:9697). Record results were posted for both the first quarter and the first half of the financial year. In addition to this, Capcom has recently been revealed as the best publisher of the year, according to Metacritic. Capcom has released their consolidated Q3 financial results, as well as their quarterly report, and the successes of the current year have continued. Over the nine months ending December 31st net sales hit ¥61.27 billion, a 28.3% year on year rise. Profits rose to a much higher percentage, with operating income showing a massive 92% YoY rise, coming in at ¥13.46bn. In this business, the Monster Hunter series served as the driving force in improving the Company’s business performance. Feature title Monster Hunter: World was a phenomenal success in the previous fiscal year, and continued to maintain popularity through the expansion of its user base, while the strong performance of the Steam version for PC boosted profits. Further, Monster Hunter Generations Ultimate, which was released in markets outside of Japan, enjoyed robust sales owing to its consistent popularity. In addition, Mega Man 11 and Red Dead Redemption 2, a distribution title, reported strong sales, while sales of Onimusha, which was released at the end of 2018, were also off to a good start. The final quarter is likely going to be equally strong too. The recent release of the Resident Evil 2 Remake should greatly assist with figures for the final quarter. To that point, Resident Evil 2 has reportedly sold through 3 million units within its first three days. To further expand the strength of the fourth quarter, Devil May Cry 5 has been scheduled for a release on the 8th of March, 2019. Capcom also has plans to further expand sales of its back catalogue of titles. Revenue and Income from other areas of Capcom are proving to be a mixed bag, at best. Amusements are proving to be a downfall, with a huge YoY fall in revenue and a current net loss of ¥639 million during the current financial year. Capcom has recently released two Pachinko/Pachislot machines based on Biohazard (Resident Evil) and Street Fighter which could, potentially, see an improvement in future sales. 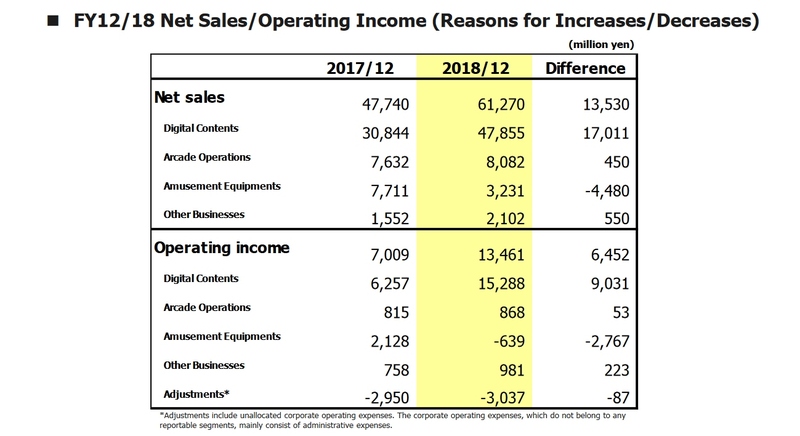 In the Pachinko & Pachislo sub-segment, the Company launched Biohazard into the Panic, Street Fighter V and other products in a shrinking market environment, and sales struggled due to the downturn in consumer confidence and dampening investments by the Pachinko/Pachislo hall operators. Under Arcades, the area has seen a small amount of growth. The company has been attempting to widen the appeal of arcade machines and their facilities. One game was launched, Capcom Net Catcher Cap Tore, which is an online crane game that can be operated from mobile phones and PC’s. in addition to this Capcom opened two stores while closing one, bringing their total to 37. Other business is specifically based around the income from royalty on their characters and IP’s, which has also seen steady growth. Much like mentioned in our coverage of H1, Capcom has no full titles announced for the future. Once Devil May Cry 5 is released, the only revenue that seems to be incoming will be from that and back-catalogue titles. Capcom, as a company, is one that tends to announce titles late in development so this could be a concern that doesn’t come to pass. However, without any large releases, the upcoming year would undoubtedly see a large reduction in revenue for gaming. Despite this lack of announcements, Capcom is still hoping for a year of growth in the future. As I stated three months ago, Capcom needs to invest the income from the success of Monster Hunter: world, Resident Evil 2 Remake and the likely success of Devil May Cry 5 to invest in future games and growth.